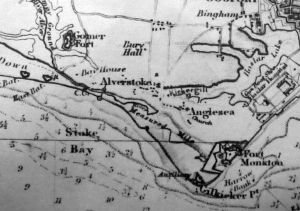 (Grid reference SZ606975) Fort Gilkicker stands on the the beach at the west end of Stokes Bay at Gosport in Hampshire. It is clearly visible from the Bay as the position it occupies dominates the safe water anchorage of Spithead in the Solent. It can be visited by travelling along Fort Road at the eastern end of Stokes Bay, Gosport and turning seawards down an approach road through the golf course to the rear of the fort. The fort is not open to visitors at present but it is possible to walk around the outside and climb the earth banks surrounding it to view the interior. As early as the fifteenth century Portsmouth Harbour was an important safe refuge for ships of the Navy patrolling the Channel. It contained a dockyard and arsenal. Spithead provided one of the chief anchorages of the Empire. It was recognised that Portsmouth and its harbour had to be defended from possible attack by land and by sea. The fortifications on the Portsmouth side were of a much more extensive nature than those on the western side at Gosport as the Naval base was situated on the eastern side. As the fortifications grew over the years it was recognised that both sides of the harbour had to be protected. By the sixteenth century both sides of the harbour mouth had fortifications to prevent an enemy running into the harbour and attacking the dockyard itself. On the Portsmouth side was built Southsea Castle and on the Gosport side Haselworth Castle was constructed on Gilkicker Point. These two forts were part of the scheme of fortifications proposed by King Henry VIII in his effort to protect his Southern shores. Haselworth Castle is first mentioned in 1545 and by 1588 rumour has it that the castle was a crumbling ruin. In 1669 two sea marks were built by Robert, Earl of Warwick who was Parliamentary Admiral to Charles the First. One stood at the side of Haselworth Castle and was know as the Gill-Kicker whilst the other stood further inland at the end of Clayhall Road near Alverstoke Church and was known as the Kicker-Gill. Both were triangular in plan and were built of stone but were heightened in the 18th. century with additions in brick. They were to be used in conjunction with each other to find the safe water passage into Portsmouth Harbour and are not to be confused with the present measured-mile markers which can be seen at Browndown and Gilkicker. The Kicker-Gill was pulled down in 1965. The origin of the names are unknown but the point at Hasilworth‘ seems to change to 'Gill Kicker‘ or 'Gilkicker‘ point after the erection of these sea marks. Daniel Defoe wrote in 1724 of 'the point of land on the side of Gosport which they call Gilkicker where also they have two batteries‘. It is safe to assume that Gilkicker gained its name from the sea mark and not the other way round. In the 1850's it was considered necessary to secure the western landward approaches to Portsmouth Harbour by building a line of fortifications. 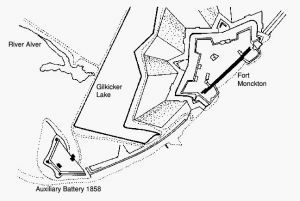 Between 1853 and 1858 two new fortifications based on the latest continental form of 'Polygonal‘ fortification were constructed at Gomer and to the north at Elson. From 1858 to 1862 three more elaborate forts (Brockhurst, Rowner and Grange) were built to fill in the gap between these two earlier forts. 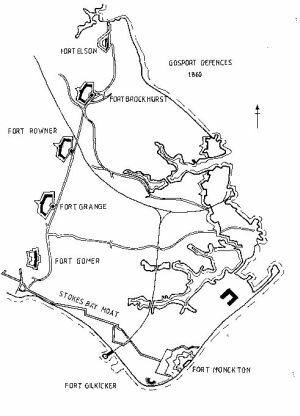 These five forts became known as the Gosport Advanced Lines. 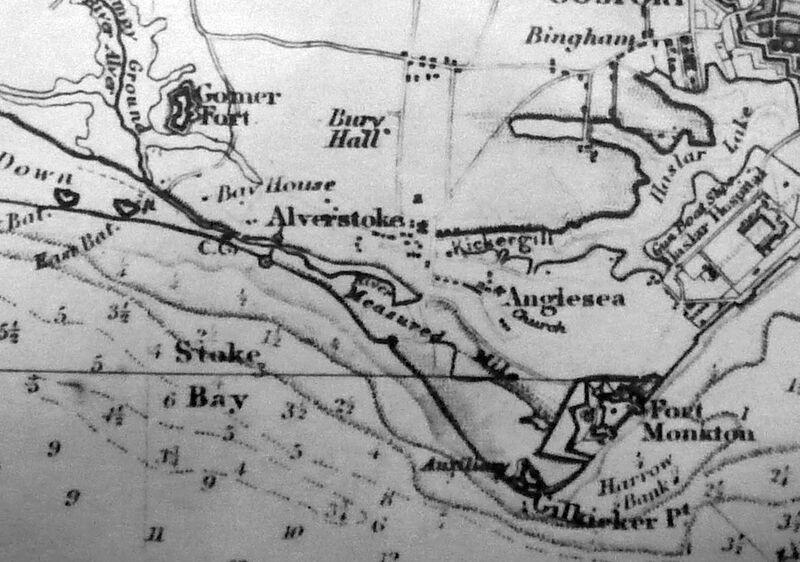 It was important to close off the southern line of approach from Stokes Bay as an enemy landing in the Bay would make the new Gosport Advanced Line ineffective. In order to make a beach landing more hazardous Fort Monckton was strengthened by the addition of an 'Auxiliary Battery‘, the first fort on the site of the present Fort Gilkicker. An earthen rampart connected the two (a distance of 500 yards). The earlier fort faced in a more westerly direction than the present one and had a wet moat in front of it. It was designed to protect the beach at Stokes Bay as well as the deep water anchorage which lay between Browndown Point and Gilkicker Point. By the 1850's England was seriously concerned by the possible intentions of France to invade England once more. The introduction of steam propulsion was a threat to the supremacy of the Royal Navy, which up till now had been able to blockade the French channel ports. In 1858, the French had constructed the fore-runner of a new class of fighting ship, La Gloire. These 'Ironclads‘ posed a particularly serious threat to the Dockyard at Portsmouth which would have to be destroyed in preparation for a French invasion. England‘s answer on the sea was the construction of its own ironclads such as 'Warrior‘. The rapid advances made in the construction of guns culminating in the invention of Armstrong‘s Rifled Breech Loading gun (R.B.L.) in 1859 showed that the land defences clearly had to be upgraded to take the new ships and guns into account. It was expected that the forces on the Continent would soon possess guns of equal performance. Under the direction of Lord Palmerston a Royal Commission was set up to 'Consider the Defences of the United Kingdom‘ with particular reference to the new rifled guns, under the Chairmanship of Sir Henry David Jones, Major General, Kt, CB. Not surprisingly James Fergusson was the Treasury official on the Committee. As part of the 1857 defence proposals by Major W.F.D. Jervois, the Assistant Inspector-General of Fortifications, a water filled ditch with a rampart was constructed by the Royal Engineers along the length of Stokes Bay. This was to link the Gomer Elson line of Forts with the Monckton and Gilkicker Forts, closing off the Bay and completing the western defences of the Harbour. Such a moat had been described by Fergusson in his 'The Peril of Portsmouth‘ published in 1855 and had been considered by Monckton as early as 1779. 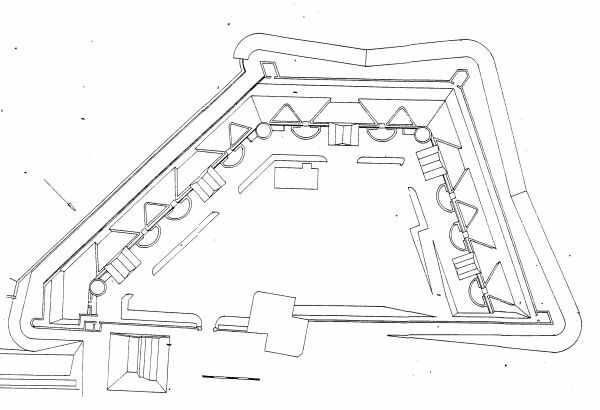 The moat was flanked by five batteries at various points. They were numbered from one to five, west to east. The River Alver was diverted into the moat to keep it supplied with water. This was under construction when the defence Committee met in 1860 and was approved by it. The Committee recognised that the Stokes Bay beach was a perfect place for a landing along its whole length. Jervois said in his report that the water was deep enough for ships to lie within 800 yards of the shore. Archer had already noted in 1773 that the beach and bay provided a fine shelving beach for troops to land under covering fire from their ships. Here they could form up before an attack was made on the surrounding high ground. Spanish intelligence reports of 1597 and the French invasion plans of 1768 and 1769 had confirmed this. Little construction had been done in the intervening years. The Commission which reported in 1860 recommended that Gilkicker should be extended and strengthened and its armament increased to nine guns. A new battery was constructed instead. Now that the defence of Stokes Bay beach was complete with its new moat and rampart this new battery was no longer needed to protect the beach and could be constructed to face out to sea and concentrate its fire on enemy shipping. The enemy were expected to try to run into the harbour through the defended narrow entrance. This was unlikely to be achieved just by relying on the destructive action of broadsides from line-of-battle ships or heavy frigates against Fort Blockhouse and the other batteries at the harbour mouth. Instead the great fear was that gun-boats would be employed to project shells to the rear of the forts, distracting the gun crews and preventing them from operating the heavy defence guns, some of which were not in casemates. These gun boats together with floating batteries were a formidable weapon in aiding an attempt by heavier vessels to force the in-shore channel. It was debated that the only way to counteract a line of such vessels, 'en echelon‘, along a course parallel to Fort Monckton, Fort Gilkicker and Fort Blockhouse was to supplement the direct fire of the heavier forts with a line of scattered batteries such as those along the Stokes Bay moat. 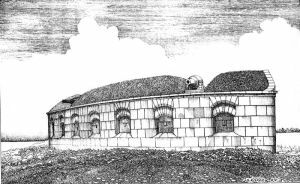 The Defence Committee in 1862 approved the design of a 'casemated battery of curvilinear form for 26 guns in one tier‘ at Gilkicker. It was to direct its principal fire on Sturbridge shoal and the flanks upon Spithead and Stokes Bay. Although by this time Lieutenant Colonel Jervois was the Deputy Director of Works for Fortifications and as such was the presiding influence over the design of the Fort at Gilkicker, the actual design was by Lieutenant-Colonel Fisher, who also designed Puckpool Battery on the Isle of Wight, Spike Island, Carlisle and Camden forts at Cork and the Southsea Castle batteries at Portsmouth. 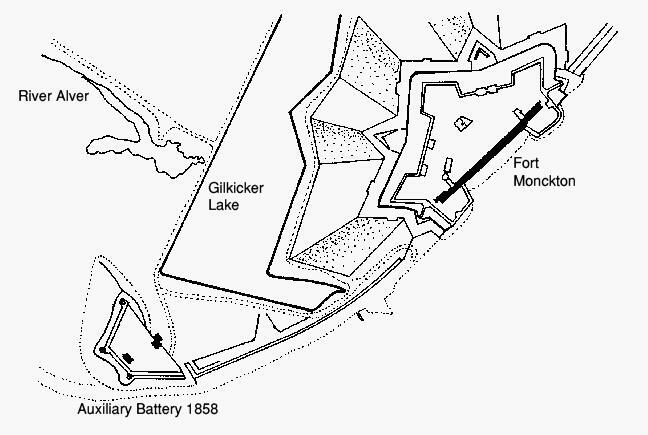 Fort Gilkicker: The first Fort Gilkicker shown on a plan of 1848 updated to 1857. Note Fort Gomer (1856) and the Browndown batteries. Fort Gilkicker: The New Fort Gilkicker gun casemates.